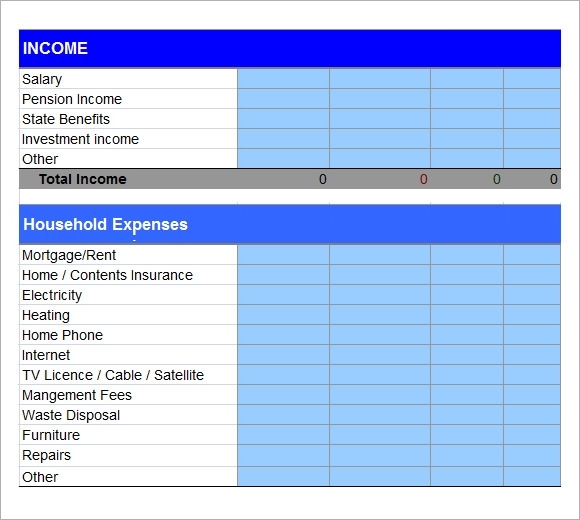 A financial budget template is a free to download tool, meant to help you account for your finances. Various developers have created and made these Budget Templates available for access on the internet, so that you get them at no extra cost. 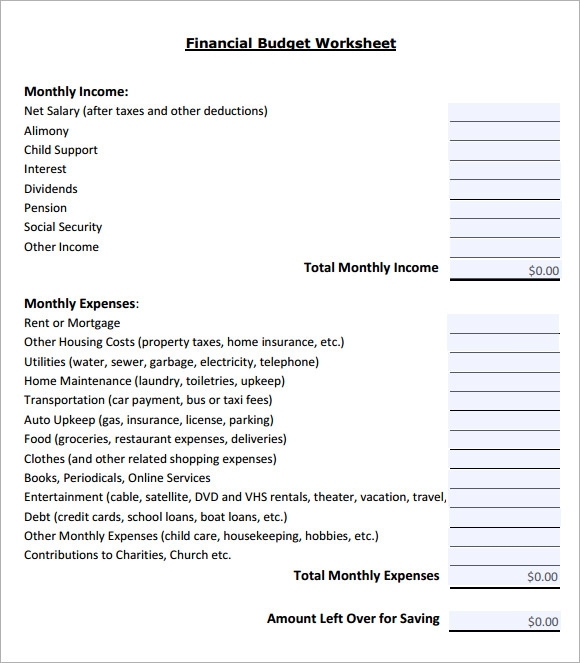 This financial budget worksheet template takes into account the net monthly salary and other sources of income such as alimony, child support, interest, dividends, pensions, social security and other income to get to the total monthly income. Then the respective monthly expenses such as rent, other housing costs such as tax etc, utilities, maintenance, transportation, food, clothes, entertainment, etc, are added to reach the total monthly expenses, which is then deducted from the monthly income to reach the amount left for savings. 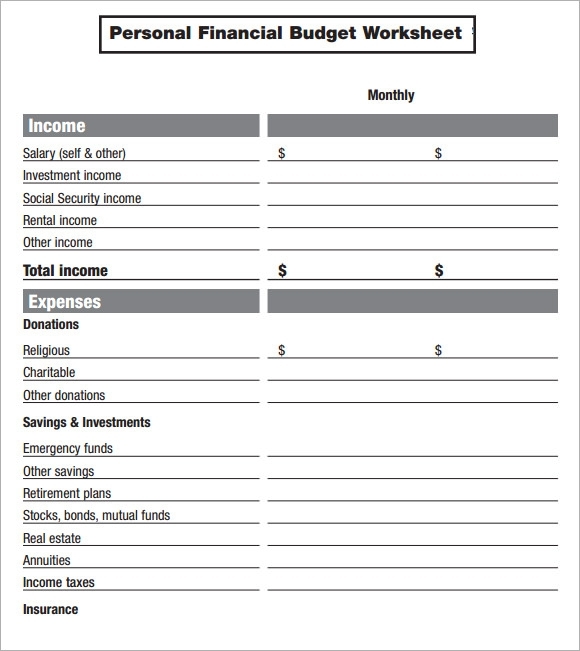 This Financial Budget template serves as an example as to what a financial budget should look like. It shows the various sources of income, and the various sources of expenses, the net excess of income over expenditure, and its allocation to various emergency funds, savings, retirement plans, mutual funds, bonds and stocks, real estate, annuities, income taxes, etc. 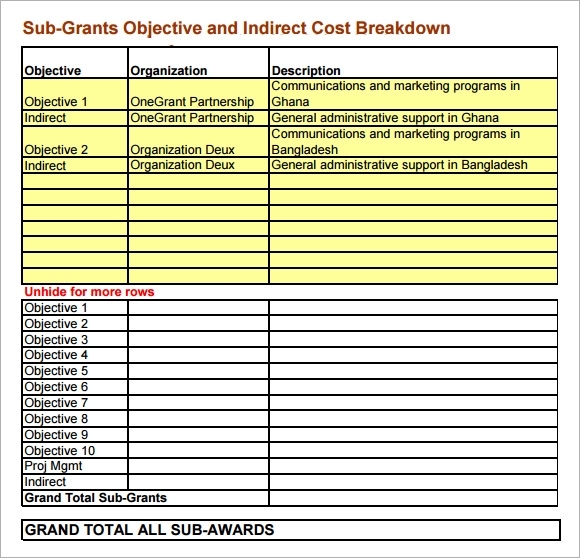 This financial budget spreadsheet gives a detailed analysis of Sub-Grants Objectives and Indirect Cost Breakdown. It states as an example that the indirect objective of a particular one grant partnership is General administrative support, communications and marketing programs in Ghana. It also states that the indirect objective of a particular organization deux is general administrative support, communications and marketing programs in Bangladesh. 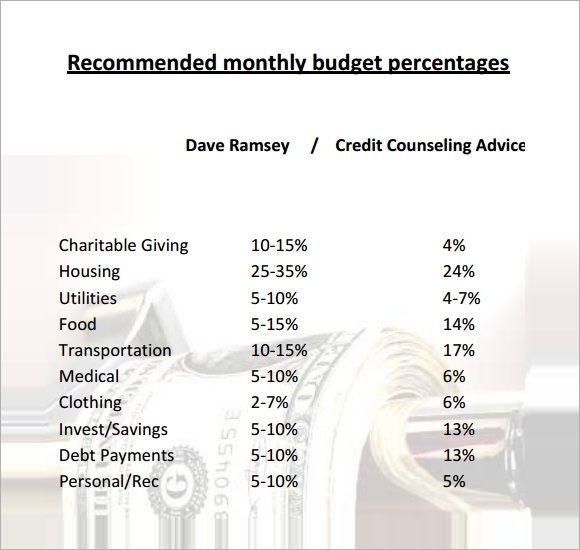 A personal budget is nothing but a budget of an individual. The income side comprises of salaries, pensions, state benefits, investment income and other such incomes. Whereas the expenses side comprises of rent, insurance, electricity, heating, telephone, internet, cable, waste disposal, furniture, repairs and others. 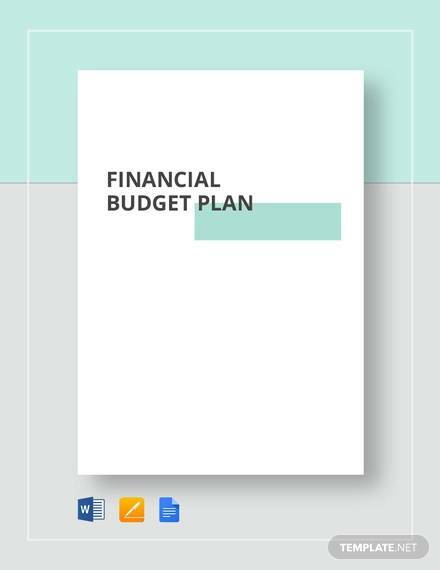 What is a Financial Budget Templates? A budget is a “quantitative expression” of a predetermined plan for a specified period of time. A budget may include pre planned sales volumes, revenue collections, quantities of resources, expenses and costs, cash flows, liabilities, assets. It explains strategically formed plans of business units, events, activities or organizations in measurable terms. 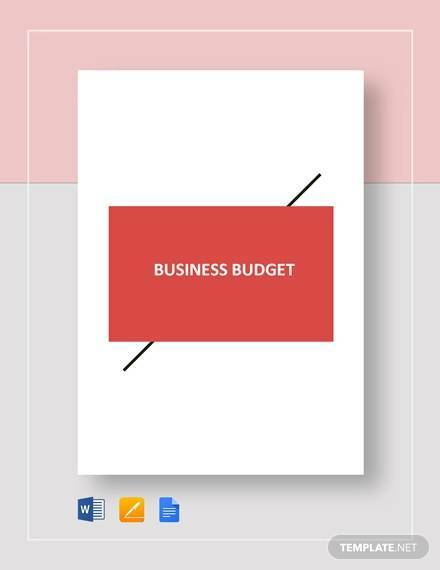 A budget is simply the sum of money which is allocated for a particular predefined purpose together with a summary of all possible intended expenditures along with various proposals for how to meet up with them. What Are The Benefits of Financial Budget Templates? Grant Budget Templates help to aid in the planning of the actual day to day operations of a firm, by forcing the managers to consider how there can occur a change in conditions and what necessary steps should be taken so as to be well equipped, and it also encourages the managers to consider the problems even before they arise. It also helps in the coordination of the various activities of the firm; by compelling the managers to cross examine the relationships between operations they themselves perform and those performed by the other departments. How To Prepare Financial Budget Templates? Financial Budgets cannot be prepared by anyone and everyone. There are professionally trained experts who are hired for this job because budgeting requires a lot of technical know-how, analysis and skill. It is not everybody’s cup of tea. 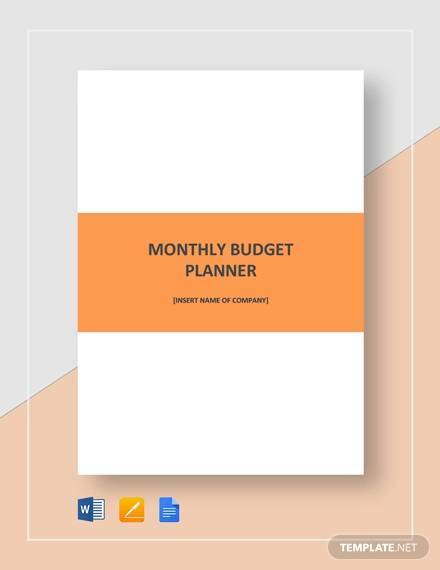 Budgeting can be very tough for lay men, so to ease your troubles, we have brought you a set of detailed budgeting templates to choose from. We have cut out your work for you, all you need to do is, download these and you should be good to go.